This study aims to compare the results of trabectome surgery between surgery-naïve eyes and eyes that have previously undergone incisional surgery. Prospective data was collected on the first 20 cases of each new trabectome surgeon. This trabectome dataset was used to create two groups of subjects: surgery-naïve eyes versus eyes with prior incisional surgery. A total of 2,051 eyes were included in the study. These two groups were further broken down into the subtype of glaucoma (primary open angle glaucoma, pigmentary, pseudoexfoliation, uveitic and steroid-induced glaucoma). 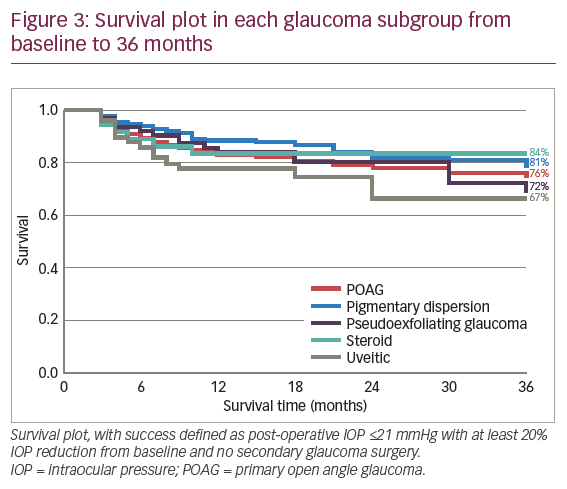 At 12- and 36-months follow up, success rates, intraocular pressure (IOP) reduction and medication usage were compared between the groups using the Tube versus Trabeculectomy Study criteria for defining success. 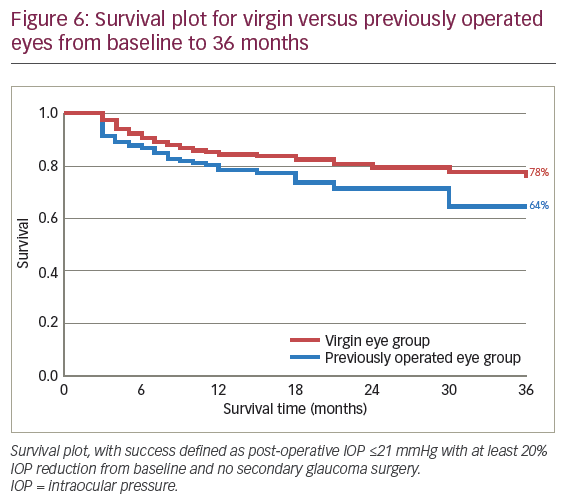 At 36 months, the IOP of the virgin eyes and the previously operated eyes was 16.3 mmHg versus 15.8 mmHg, respectively. This difference was not statistically significant (p<0.05). Trabectome outcomes are similar in eyes with a history of prior incisional surgery (including failed glaucoma procedures) compared with those that are surgery-naive. Sameh Mosaed has nothing to disclose in relation to this article. Compliance with Ethics: All procedures were followed in accordance with the responsible committee on human experimentation and with the Helsinki Declaration of 1975 and subsequent revisions. Informed consent was received from the patients involved in this study. Trabecular bypass with the Trabectome® device (NeoMedix, Tustin, CA, US) has been gaining adoption worldwide since its introduction as a micro-incision glaucoma surgery (MIGS) option for many differing types of glaucoma. As with any new surgical procedure, surgeons rely on published data to guide their decision making and patient-selection criteria until they gain adequate individual experience to refine their adoption patterns. The trabectome was initially used on adult patients with open-angle glaucoma in the original trials performed in 2004.1,2 As several dozen peer-reviewed publications have confirmed its safety and efficacy, the last decade has seen the utilisation of trabectome surgery expand over a wide variety of glaucoma subtypes from mild to severe glaucoma.3–6 Here, we will review the long-term success rates and intraocular pressure (IOP) reduction profiles in these subtypes to help guide surgeons in optimising patient selection. 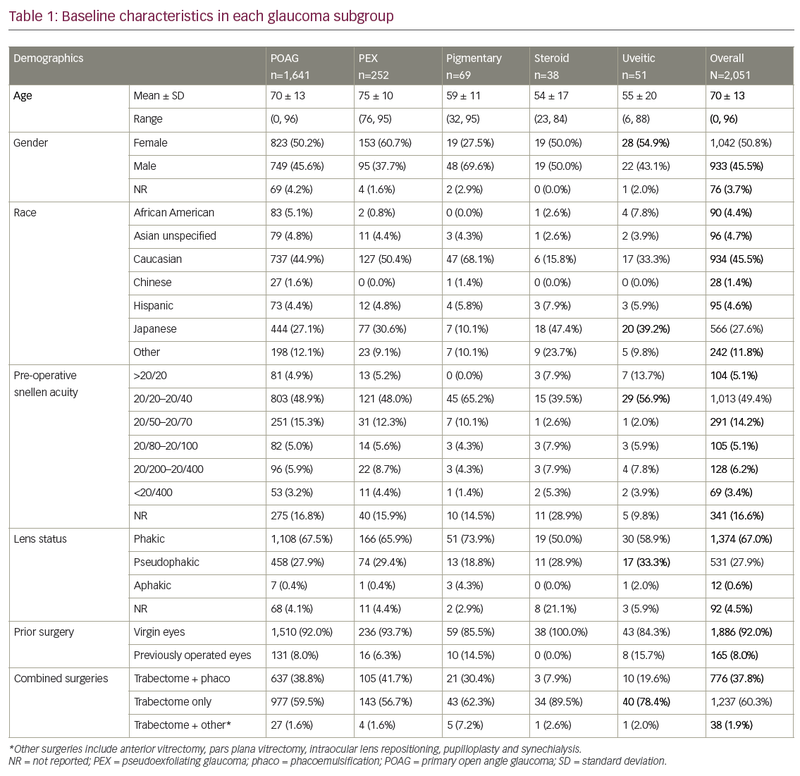 This is a prospective outcome analysis of patients grouped by glaucoma subtypes with or without prior incisional surgery undergoing trabectome from the Trabectome Study Group Database. All procedures were followed in accordance with the responsible committee on human experimentation and with the Helsinki Declaration of 1975 and subsequent revisions. Informed consent was received from the patients involved in this study. The multinational trabectome database consists of anonymised data collected prospectively on the first 20 cases of each new trabectome surgeon and includes demographic information as well as IOP as measured by Goldmann applanation tonometry, gonioscopic findings, optic nerve appearance on slit-lamp examination, Humphrey Visual Field results at baseline and following treatment, best corrected visual acuity and any adverse event data. We analysed the trabectome database and included all patients with at least 1 year of follow up. Patients were classified based on their glaucoma subtypes. Only patients who were diagnosed with primary open-angle glaucoma (POAG), pseudoexfoliation glaucoma (PEX), pigmentary glaucoma, steroid induced glaucoma and uveitic glaucoma were included into this study (the steroid-induced glaucoma group included only ocular steroids: topical and intravitreal). No patients were double counted in the groupings. Patients were separated into two groups based on a history of prior eye surgery (prior incisional surgery versus virgin eyes), excluding laser. The surgery-naive group (virgin eyes) was compared to eyes with a history of any of the following procedures: trabeculectomy (with or without EX-PRESS® shunt [Alcon, Fort Worth, TX, US]), trabeculotomy, aqueous shunt implantation, corneal transplantation, goniotomy, prior trabectome or iStent® (Glaukos, San Clemente, CA, US) or other MIGS, or vitreo-retinal surgery. study, success was defined as IOP of <21 mmHg and IOP reduction of 20% from baseline on two consecutive visits and no secondary surgery.7 Preoperative and post-operative outcomes were compared with the two-sample Wilcoxon test. Kaplan Meier survival curves plot and Log-rank tests are used to compare survival rates of the two groups. Excel software (Microsoft Word Corp.) and R 2.14.0 were utilised for the data compilation and statistical analysis. 38 with steroid-induced glaucoma and 51 with uveitic glaucoma. (Table 3 and Figure 3). IOP was reduced by 30% (from 23.2 ± 7.7 to 16.3 ± 4.2 mmHg) and 33% (23.7 ± 7.0 to 15.8 ± 4.7 mmHg; p<0.01), respectively. 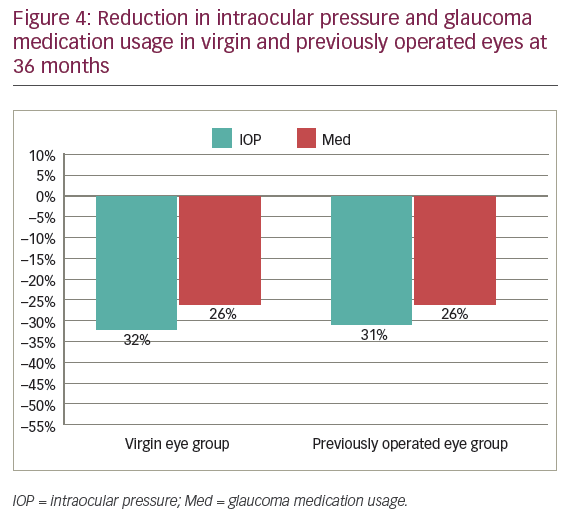 Medication usage reduced by 26% in virgin eyes compared to 31% in previously operated eyes (p<0.01 for both) (Table 2, Figure 4 and Figure 5). 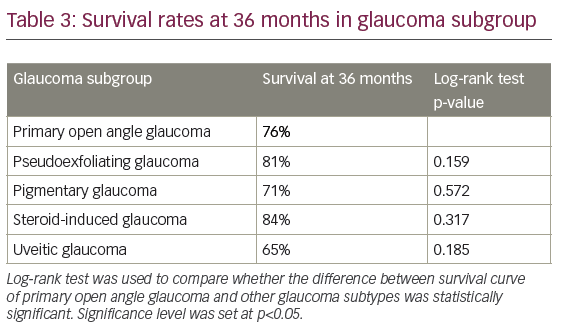 subtypes’ survival values at 36 months (Table 3). Reported post-operative complications are summarised in Table 5. Fourteen percent of subjects did not achieve adequate IOP control and required subsequent glaucoma surgery. There were no reported cases of clinically significant hypotony or choroidal effusions. In this study, patients with combined cataract surgery were grouped together with patients with trabectome-alone procedures. Several prior publications have suggested that combined procedures result in more robust outcomes and higher success rates as compared to stand-alone cases.17 There have, however, been several recent reports suggesting that the addition of phacoemulsification does not result in additional IOP reduction.18,19 Since we were not intending to once again look at these differences, but rather identify the differences within subcategories of glaucoma, we did not separate out patients with combined trabectome and phacoemulsification. Both the previously-operated eyes and the virgin eye groups had similar numbers of stand-alone versus combined procedures, negating any difference from phacoemulsification in the results. Another finding demonstrated with these long-term results was that trabectome performed very well following prior incisional surgery, with a success rate of 65% at 36 months versus 78% in the virgin eyes. While this outcome suggests a better response in the virgin eyes, it is important to note that our data included eyes with prior vitreoretinal procedures, corneal transplantation and vitrectomies. Again, many of these eyes had mechanisms of glaucoma that were multifactorial and subject to continued insults such as intravitreal steroid injections, the presence of silicone oil and peripheral anterior synechia formation. A recent report by Wecker et al. looked at trabectome outcomes following failed trabeculectomy and found promising success rates, concluding that this could be considered a valuable procedure following failed trabeculectomy.20 Another study found that prior failed tube shunt implantation did not decrease the efficacy of trabectome surgery.21 Finally, a study based in Europe by Widder et al. concluded that prior tube or trabeculectomy surgery did not affect the outcome of subsequent trabectome procedures.22 Collectively, this body of evidence supports the use of the trabectome in these challenging and refractory cases. Additionally, several recent publications showed no difference in success rates between patients with mild disease versus severe disease based on visual field loss and optic atrophy.23–25 A recent study by Ahmed et al. demonstrated that 12-month success rates of patients with mild disease was 86% as compared to 83% for those with moderate/severe disease.25 This challenges our traditional thinking of considering MIGS only in early to moderate disease. Indeed, some more recently approved MIGS implants such as the Cypass® (Alcon, Fort Worth, TX, US) and the iStent are currently only approved for early to moderate glaucoma. As a result, MIGS surgery is typically positioned as an early intervention and not routinely employed in late-stage cases. Several dozen publications on the trabectome in various disease states, in the hands of different surgeons and with numerous other ocular comorbidities, all conclude that IOP following trabectome typically stabilises in the mid-teens range.5,26,27 These results support the consideration of the trabectome anywhere along the arc of disease where IOP in the mid-teens would be acceptable. There are several limitations to this study which bear mention. Firstly, this dataset represents the learning curve of many new MIGS surgeons. Presumably, the results here may be poorer than in cases of experienced surgeons, but that is uncertain. Additionally, the surgeons voluntarily update the results of their subjects over time. This may induce reporting bias to favour reporting of successful outcomes over poorer ones. Also, these surgeons are mainly referral physicians that refer the patients back to the comprehensive ophthalmologist once they are stable. Therefore, they may not have data on the successful patients years after treatment, but will more likely see the failures referred back. This may result in longer-term data on the failures as opposed to the longer-term successes. Nonetheless, this dataset represents the largest collection of information on a newer technology with the longest follow-up period available and therefore still can yield valuable insight. As glaucoma is a long-term disease, logic dictates that treatments with long-term proven safety and efficacy be preferentially employed over procedures where the efficacy significantly wanes over time. As a result, many glaucoma surgeons have taken a more measured approach to adoption of these newer techniques. At this point in time, with over a decade of robust experience, surgeons can utilise these data to help predict outcomes in specific subsets of disease to more confidently assign treatments in a tailored fashion to individual patients. Given the well-established long-term safety profile of the trabectome and encouraging efficacy results across the spectrum of disease severity, this study shows that it can be considered as a valuable surgical option even in patients with refractory disease. Minckler D, Baerveldt G, Ramirez MA, et al. Clinical results with the trabectome, a novel surgical device for treatment of open-angle glaucoma. Trans Am Ophthalmol Soc. 2006;104:40–50. Minckler D, Mosaed S, Dustin L, et al. Trabectome (trabeculectomy—internal approach): additional experience and extended follow-up. Trans Am Ophthalmol Soc. 2008;106:149–60. Jordan JF, Wecker T, van Oterendorp C, et al. Trabectome surgery for primary and secondary open angle glaucomas. Graefes Arch Clin Exp Ophthalmol. 2013;251:2753–60. Mosaed S. The first decade of global trabectome outcomes. 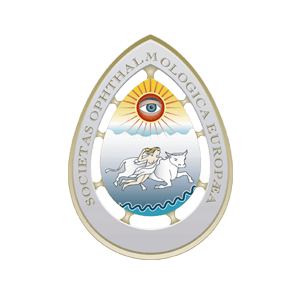 European Ophthalmic Review. 2014;8:113–9. Mizoguchi T, Nishigaki S, Sato T, et al. Clinical results of trabectome surgery for open-angle glaucoma. Clin Ophthalmol. 2015;9:1889–94. Kaplowitz K, Bussel II, Honkanen R, et al. Review and meta-analysis of ab-interno trabeculectomy outcomes. Br J Ophthalmol. 2016;100:594–600. Gedde SJ, Schiffman JC, Feuer WJ, et al. Treatment outcomes in the Tube Versus Trabeculectomy (TVT) study after five years of follow-up. Am J Ophthalmol. 2012;153:789–803. Ting JL, Damji KF, Stiles MC. Ab interno trabeculectomy: outcomes in exfoliation versus primary open-angle glaucoma. J Cataract Refract Surg. 2012;38:315–23. Ngai P, Kim G, Chak G, et al. Outcome of primary trabeculotomy ab interno (Trabectome) surgery in patients with steroid-induced glaucoma. Medicine. 2016;95:e5383. Sng CC, Barton K. Mechanism and management of angle closure in uveitis. Curr Opin Ophthalmol. 2015;26:121–7. Anton A, Heinzelmann S, Neß T, et al. Trabeculectomy ab interno with the Trabectome® as a therapeutic option for uveitic secondary glaucoma. Graefes Arch Clin Exp Ophthalmol. 2015;253:1973–8. Noble J, Derzko-Dzulynsky L, Rabinovitch T, Birt C. Outcome of trabeculectomy with intraoperative mitomycin C for uveitic glaucoma. Can J Ophthalmol. 2007;42:89–94. William A, Spitzer MS, Doycheva D, et al. Comparison of ab externo trabeculotomy in primary open-angle glaucoma and uveitic glaucoma: long-term outcomes. Clin Ophthalmol. 2016;10:929–34. Almobarak FA, Alharbi AH, Morales J, Aljadaan I. Intermediate and long-term outcomes of mitomycin C–enhanced trabeculectomy as a first glaucoma procedure in uveitic glaucoma. J Glaucoma. 2017;26:478–85. Kwon HJ, Kong YX, Tao LW, et al. Surgical outcomes of trabeculectomy and glaucoma drainage implant for uveitic glaucoma and relationship with uveitis activity. Clin Exp Ophthalmol. 2017;45:472–80. Dang YL, Cen YJ, Hong Y, et al. Safety and efficiency of trabectome-mediated trabecular meshwork ablation for Chinese glaucoma patients: a two-year, retrospective, multicentre study. Chin Med J (Engl). 2018;131:420–5. Okeke CO, Miller-Ellis E, Rojas M. Trabectome success factors. Medicine. 2017;96:e7061. 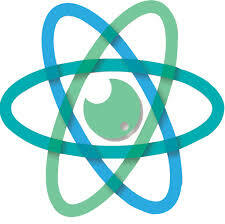 Neiweem AE, Bussel II, Schuman JS, et al. Glaucoma surgery calculator: limited additive effect of phacoemulsification on intraocular pressure in ab interno trabeculectomy. PLoS One. 2016;11:e0153585. Parikh HA, Bussel II, Schuman JS, et al. Coarsened exact matching of phaco-trabectome to trabectome in phakic patients: lack of additional pressure reduction from phacoemulsification. PLoS One. 2016;11:e0149384. Wecker T, Neuburger M, Bryniok L, et al. Ab interno trabeculectomy with the Trabectome as a valuable therapeutic option for failed filtering blebs. J Glaucoma. 2016;25:758–62. Mosaed S, Chak G, Haider A, et al. Results of trabectome surgery following failed glaucoma tube shunt implantation: cohort study. Medicine. 2015;94:e1045. Widder RA, Dietlein TS. Surgical options before and after trabectome surgery: impact of previous surgeries, possibilities of revision surgery and complication management. Ophthalmologe. 2016;113:914–7. [Article in German]. Dang Y, Roy P, Bussel II, et al. Combined analysis of trabectome and phaco-trabectome outcomes by glaucoma severity. Version 2. F1000Res. 2016;5:762. Loewen RT, Roy P, Parikh HA, et al. 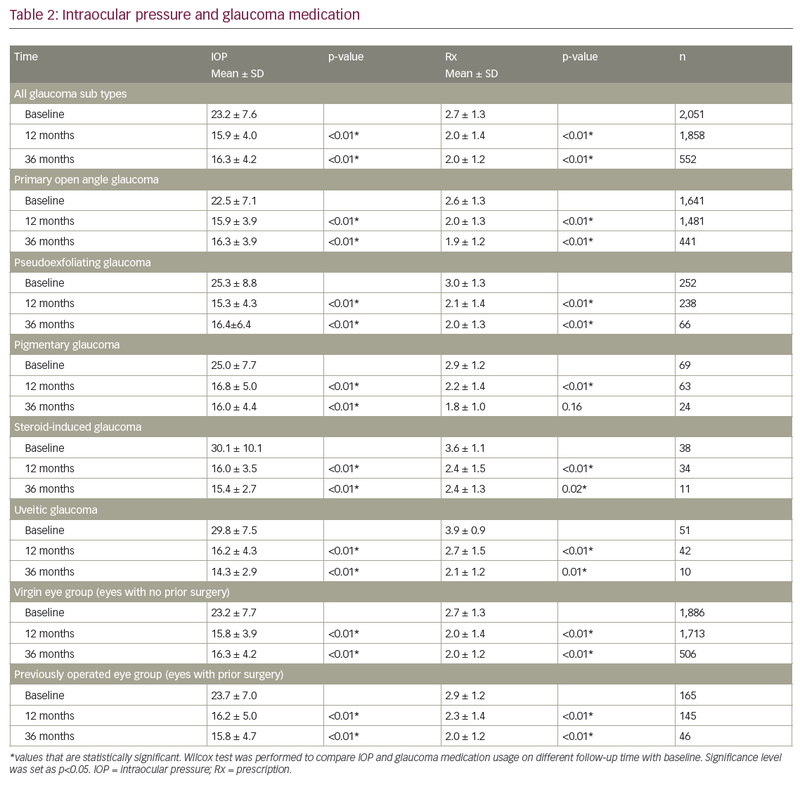 Impact of a glaucoma severity index on results of trabectome surgery: larger pressure reduction in more severe glaucoma. PLoS One. 2016;11:e0151926. Ahmed SF, Bhatt A, Schmutz M, Mosaed S. Trabectome outcomes across the spectrum of glaucoma disease severity. Graefes Arch Clin Exp Ophthalmol. 2018; doi: 10.1007/s00417-018-4023-8 [Epub ahead of print]. Yildirim Y, Kar T, Duzgun E, et al. Evaluation of the long-term results of trabectome surgery. Int Ophthalmol. 2016;36:719–26. Vinod K, Gedde SJ. Ab interno trabeculectomy: patient selection and perspectives. Clin Ophthalmol. 2016;10:1557–64.